The following are frequently asked questions on the characteristics of hibi or how to use it. Q. I have not struck a match. I don’t have clear image on how much force I should apply when striking a match head. A. Read the Instructions for Use accompanying in the product package. Refer to ‘the page ‘how to enjoy hibi’. 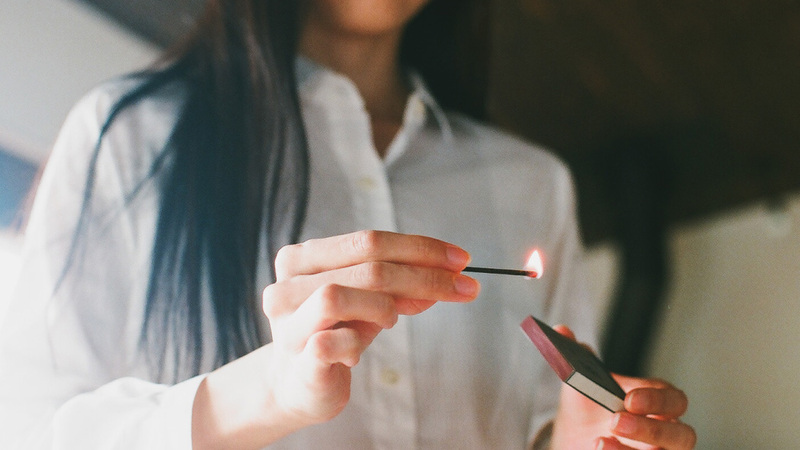 If you are not confident about using hibi, it is recommended to try lighting ordinary matches before using hibi. Q. What should I do when fire goes out before the flame has spread to the incense part of hibi? A. You can use hibi by lighting it with a lighter or a match in the same way as you would light usual incense. As flame has characteristics to burn upward, if you hold the tip end of the stick in a slightly head-down position than in a horizontal position when you light it, you can avoid the flame going out. If the flame is about to go out, tilt it the head-down to make a larger flame. Q. The flame does not spread to the incense part of hibi. A. Make sure that you don’t put out the flame hastily before it settles. When you wait until the flame goes out on its own, and flame spread to the incense part and you can enjoy the initial fragrance of the incense without being affected by the smell of the ignition material. Q. What should I do when hibi breaks? A. It is dangerous to light hibi which has become shorter after breakage.Your fingers may get burned by the heat. Discard the top end of hibi ( the ignition part) and light the remaining part with a lighter or a match. Q. Can I use it outdoor? A. You can use hibi outdoors as well if you take precautions against fire. If you light it when the wind is strong, the flame may not spread to the incense part of hibi because it may be blown out by the wind. In such a case, use it after creating a wind-proof setting. You cannot use hibi in a rainy or wet environment as the flame goes out by the water. Q. Can I use something other than the exclusive mat? A. It is recommended to lay hibi on the exclusive mat in order to ensure it burns to the end. Hibi has a larger diameter than the conventional incense, it may not be fit into the incense stand available on the market. Q. Is there an expiration date for hibi? A. Basically, there is no expiration date, but it is recommended to keep it in its package and use it within around 3 years. Be sure to keep it in a place away from excessive humidity and direct sunlight in order to avoid deterioration of fragrance and degradation of ignition performance. Q. Won’t hibi light spontaneously? A. The spontaneous ignition temperature of hibi is over 200℃．It would not light spontaneously under normal conditions. Q. How long does hibi’s fragrance last? A. Even though hibi continues to burn for 10 minutes, a lingering scent remains even after it burns out. The lingering scent may vary depending on individual difference in the sense of smell, the size or ventilation of the room, etc.